Romania is becoming an increasingly popular dental tourism destination and one of the main advantages it has over its European neighboring countries is the quality-price ratio. Dental treatments are affordable and are performed at a high level of professionalism. Moreover, Romania is easily accessible from other European countries and you will always find great accommodation offers for cheaper prices than in Western Europe. We take a look at the dental prices in Romania compared to those in France and we evaluate some of the most important adjacent costs a foreign dental patient will need to be prepared for when visiting Romania. In Romania, tourists will enjoy lower prices for transportation and accommodation. 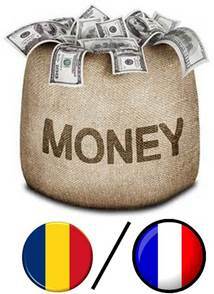 The currency used in the country is the leu, and one Romania leu equals approximately 0.22 euro. Thus, we can situate the average prices for transportation in Bucharest at 0.44 euros for two metro tickets or 0.28 euros for one bus or tram ticket (only urban lines). In France these prices are higher, at approximately 1.8 euros per one metro bus or tram ticket. Taxi fares in Romania start at 0.4 euros start tariff and are approximately 0.30 euros per kilometer. Taxi fares in France average at 1.5 euros per kilometer and start tariffs average at 3 Euros. Accommodation and meals are less expensive in Bucharest compared to Paris and prices can be even lower in other Romanian cities. The lowest accommodation rates in Paris can be found in hostels located a few kilometers away from the city center. In Bucharest, you can find affordable accommodation in ultra-central locations. Romania is also more affordable when it comes to dental treatments. If in Romania the approximate average price for cosmetic procedures like teeth whitening is around 230 euros, in France the price is around 400 euros. 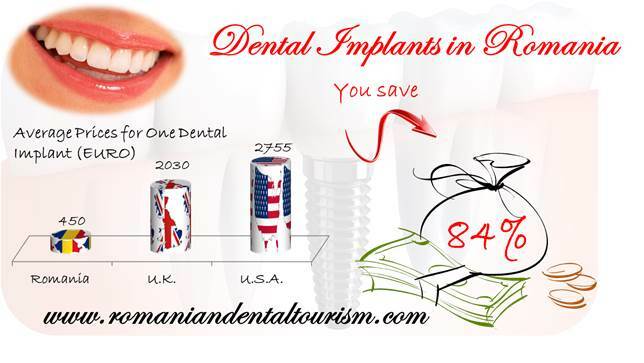 Dental implants in France have prices starting at 750 euros and in Romania the starting price is only 470 euros. The lowest price for dental crowns in France is more than 500 euros for chrome crowns and zirconium crowns are even more expensive, starting at 800 to 1000 euros. In Romania, our dentists work with porcelain crowns and the prices are up to 350 euros. The prices for transport and accommodation in Romania justify why many foreigners choose to travel to Romania and schedule their dental treatments at a Romanian dental office. Moreover, the quality of the services offered by the Romanian dentists rivals with those in France. 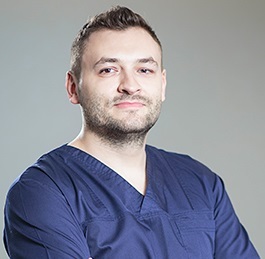 If you want to schedule an appointment at one of our clinics in Bucharest or simply want to know more about the services we can provide, please contact our dentists. It's great seeing clients from as far as Japan or United States visit our clinic. That is true satisfaction for any professional! Copyright © 2011 - 2019 Dental Tourism in Romania. All Rights Reserved.